This week’s PGA Championship returns to Valhalla Golf Club, site of the 1996 & 2000 PGA Championships and the 2008 Ryder Cup. This tournament comes at a nearly perfect time as the major stars of the game have just been destroying everyone for the last month. Rory McIlroy won the Open Championship and WGC-Bridgestone, Justin Rose won at Congressional and at the Scottish Open, Sergio Garcia has multiple runner-up finishes, and Adam Scott is playing as well as he has in his career. If you ignore the question of whether Tiger will play or not, there’s still a ton of story lines this week. Valhalla is built out of parkland outside of Louisville, Kentucky. Playing from the tips it measures 7458 yards for a par of 71, longer than most courses the pros face week to week, but not notably long compared to recent PGA Championship courses. Water comes into play on around half of the holes – mainly in the form of a creek along the fairway or pools near the greens. The fairways aren’t wide and the rough will be penal, so I don’t think this is a course where you want to spray it around too much. At the same time, about half the fairways are lined only with rough and bunkers. That limits the danger of an errant drive. Valhalla, then, is a long test. It will absolutely reward the best iron players, but most courses do. Outside of the eternal question of whether to lay-up or hit driver, it is a course that forces you into shots, rather than allowing for multiple options. The short par 4 4th could be set-up as a drivable par 4, but if not it’s a boring 3 wood-wedge hole. The par 4 6th hole’s fairway ends ~300 yards from the tee, meaning everyone’s going to be left with the same 200+ yard approach shot. The par 4 12th runs out of fairway around 300 yards as well, leaving everyone again hitting to around 275 to avoid hitting out of the rough off a down slope. The par 4 13th features an elevated island green, but will be a certain lay-up and wedge for every player this week. The one hole that offers any choice in real strategy is the par 5 7th. It offers a split fairway – the left fairway offers a shorter route to the green, but the approach shot requires at least a 225 yard carry over water, while the right fairway adds 40 yards to the hole and will limit opportunities to go for the green in two. The long hitters would be out of their minds not to hit it left; it’s an obvious birdie hole going left, while going right will make it play much closer to par. There will be talk all week from the commentators about risk and reward with this hole, but there’s plenty of room on the left fairway and even an average hitter can carry a hybrid 225 yards. It’s a different story for the shorter hitters though. Guys like Furyk, Luke Donald, and even G-Mac may not have the stick to play left. The four obvious names are Rory, Sergio, Adam Scott, and Justin Rose. They’re the four best in my ratings, the four best so far this year, and four of the six best in the last two months (Furyk, Fowler are the others). That’s as close to clear-cut as you’ll ever get in golf. Beyond them, this might be Furyk‘s best chance to win another major. He hasn’t been this high in my ratings since he won the FedEx Cup in 2010. 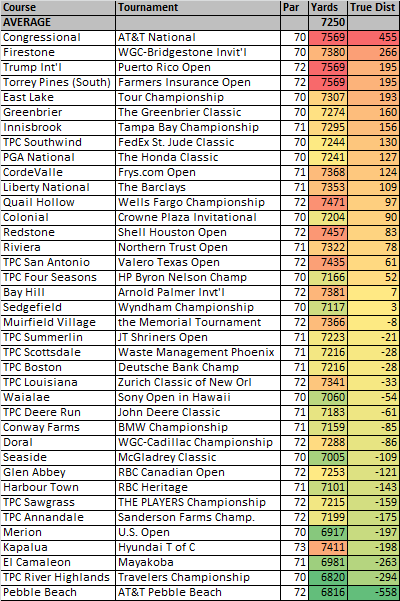 Bill Haas hasn’t received any attention all year, but he’s in that second group of guys with ~2% chance to win. Further down, I’d be remiss if I didn’t pump up Francesco Molinari’s chances again. He’s going to be as good or better than a half dozen guys on the European Ryder Cup team, so it’d be nice to see him make it on merit. Long putts are the most random element of golf. Pros hit about 15% of their 15-25 foot putts and face around seven putts of that length per round. Hitting an extra 5% of your 15-25 footers, even just from chance, will cut almost a third of a stroke off your score – enough to take a player from 100th in putting to 40th. The problem analytically is that putting from this range fluctuates wildly year to year for the pros; it’s common for a pro to lose or gain 5% between seasons. Ryan Moore finished 2nd on Tour in 2012 and 7th to last in 2013. Rickie Fowler finished 4th in 2011 and 2nd to last in 2012. John Merrick sandwiched an 8th place finish in 2011 between two well below-average ones in 2010 and 2012. 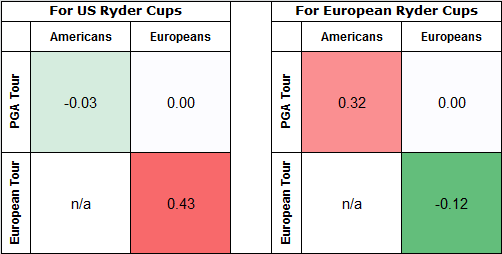 I averaged conversion rates from 15-25 feet for everyone on Tour between 2010 and 2013 and compared them to 2014. The results show performance even over multiple seasons regresses by 75% to the mean. That means if you’re the best on Tour one year, you’ll finish more like 50th on Tour the next season. In short, putting from 15-25 feet isn’t consistent at all year to year. Instead, aggregating performance across multiple seasons gives a much better indication of expected performance. That’s a problem analytically because, as shown above, a hot streak can really lower a player’s score. Each extra putt sunk from 15-25 feet is worth 0.85 strokes gained. Taken to the extreme, Bubba Watson (12% average between 2010-13, 25% average this season) has gained around 0.75 strokes just from 15-25 foot putts. We have no idea whether that represents a genuine change in his putting ability or, more likely, just a hot streak. In fact, the three largest over-achievers in strokes gained putting this season (relative to recent seasons) are all in the top ten for over-achieving in putting from 15-25 feet (relative to recent seasons). 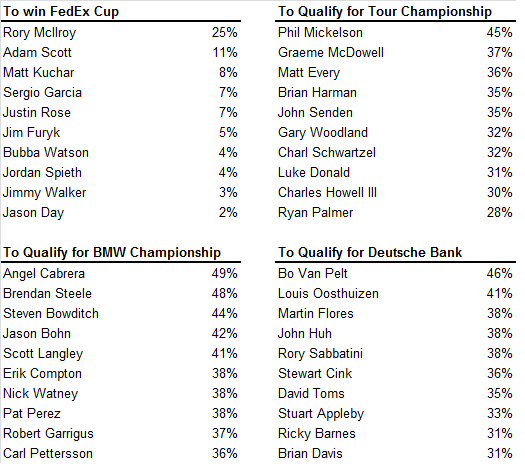 That may indicate some regression ahead for Matt Every, Graeme McDowell, and Adam Scott (AimPoint though). Among trailers, Kevin Stadler could cut around 0.4 strokes off his scoring just by putting at his career average from 15-25 feet. This is the former AT&T National, still at Congressional CC. Tiger Woods returns from his three month hiatus this weekend at his tournament. That’s the main story obviously this week; Tiger’s season had hardly even begun when he hobbled home for his last competitive rounds at Doral (only 4 events played), but it certainly hadn’t been successful – only a withdrawal, a made the cut/did not finish, T41, and T25. That said, Tiger has been the best player in the world statistically and in terms of tournaments won over the two previous seasons. An in-form, pain-free Tiger is the best player in the world still, for my money. He’s alluded to some rust from lack of preparation so I wouldn’t get too wound up about him contending this week, but I’ll try to update everyone on how he’s hitting his longer shots in the early rounds. He’s been putting and playing shorter shots for awhile now, but he said he’s only recently been extending himself and getting distance back. If he’s hitting long and accurately, it might indicate he’s back in business a little earlier than we might expect. Onto the course, Congressional is the brute of the PGA Tour, measuring at nearly 7600 yards for a par 71 – it’s the longest regular course on Tour by True Distance (which adjusts for the par of the course). The course averaged 72.6 over 2012-13 (4th hardest on Tour), largely because of that distance, but also because it has some of the most difficult to putt greens on Tour. 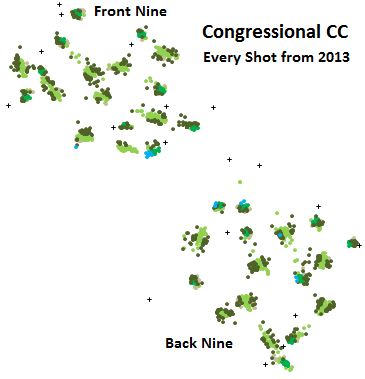 Congressional also plays harder than average on middle/short length approach shots (<175 yards) based on my limited data. 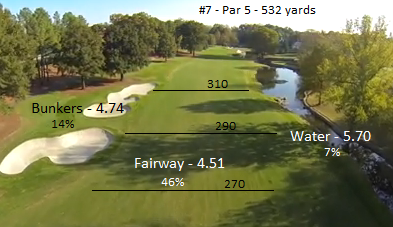 Off the tee the course is very long with narrow (~25-27 yard) fairways which yield a normally low driving accuracy. However, the course is actually very easy off the tee, rewarding long drives and rarely punishing wild ones. The fairways are cut narrow, but the area given over to the rough is expansive. In last year’s final round, only 1% of drives ended up somewhere besides the fairway/rough/fairway bunker (trees, out of bounds, water, etc.). The Tour average is around 3-4%. 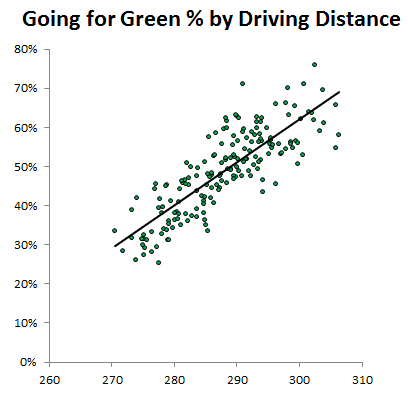 This means that a lot of drives are missing the fairway, but fewer than normal are ending up with those catastrophic misses that cost big strokes. The rough at Congressional isn’t particularly penal and the fairway bunkers are statistically pretty easy to play out of, meaning a strategy based on hitting for distance and not worrying about accuracy is ideal here. 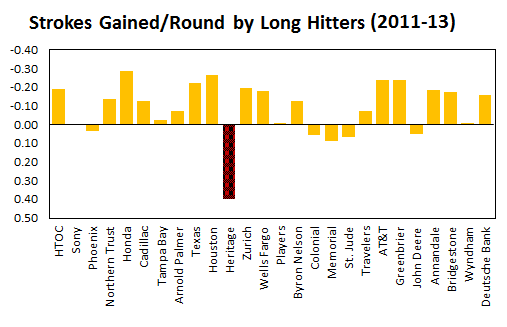 The results bear that out; in 2012-13, players who hit for more distance were advantaged relative to the shorter hitters. Bump up J.B. Holmes and Gary Woodland a bit. 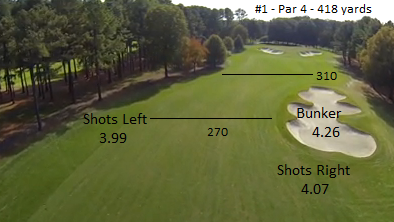 One thing that holds the longer hitters back a bit is that it’s pretty difficult to hit the par 5s in two. 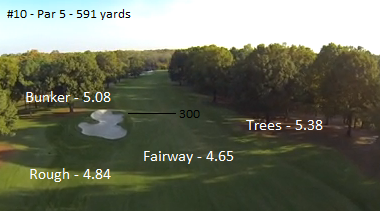 The 9th measures 636 yards and if the length wasn’t enough, a ravine right before the green makes it a certain layup. Both the 6th (water) and 16th (multiple greenside bunkers) are very well defended to dissuade anyone who didn’t hit a perfect drive. There isn’t a drivable par 4 on the course either.